Direct investment by the Department of Defense is a key economic driver in the state. The salaries paid to active duty, reserve, and civilian DoD employees, as well as the many DoD contracts executed with companies in the state, provide a direct and tangible means of economic growth in California’s communities. A number of entities have attempted to quantify this impact, and these efforts are referenced below. The Governor’s Military Council, in conjunction with the Governor’s Office of Planning and Research, released the 2018 Statewide National Security Economic Impact Study at the Third Annual All California Defense Summit in August 2018. The study, conducted by the California Research Bureau, a division of the California State Library, details the economic and employment impacts of direct spending in the state by the federal Department of Defense, the Department of Homeland Security, and the Department of Veterans Affairs. 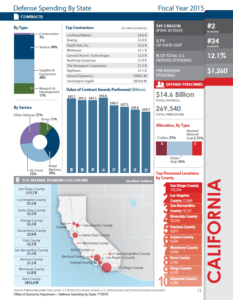 Besides providing statewide figures, the report breaks down the impact by county to give a picture of how national security spending drives California’s economy. This report documents the results of a state-by-state analysis of spending by the U.S. Department of Defense (DoD) during Fiscal Year (FY) 2016 in the 50 states and the District of Columbia. The report may be used as a source of information and statistics on links between defense spending and a state’s economy, particularly in relation to defense-related employment and industry, as well as how defense spending received by a state compares with other states. California again ranks first in total defense spending by the DoD. The report can be accessed here: http://oea.gov/resource/defense-spending-state-fiscal-year-2016. The San Diego Military Advisory Council (SDMAC) has recently published its 10th Anniversary Economic Impact Study, a report detailing the economic footprint of the military in the greater San Diego region. This study, conducted by a team from the Fermanian Business and Economic Institute at Point Loma Nazarene University led by economist Dr. Lynn Reaser, can be obtained here. The study provides a detailed look at the many direct economic benefits the Department of Defense provides the San Diego community, where it generates over 300,000 jobs, representing 1 in 5 in the county and generates an estimated $44.7 billion in Gross Regional Product. March ARB conducted an Economic Impact Analysis in 2016, this study aggregates the impact of all units on or adjacent to March ARB that would likely leave the area if the base were to close. The base supports almost 10,000 jobs, not including creating over 3,000 jobs in the areas outside the base, and has an estimated economic impact of $579 million. This 2013 document detailing the base’s extensive involvement with the surrounding community contains a section focused on the direct economic impacts it has for the surrounding San Bernadino County communities. The Combat Center is the main economic driver in the Morongo Basin and one of the largest employers in the county, contributing an estimated $1.7 billion annually to the local economy. The installation supports 24,300 jobs, or nearly 77 percent of all employment in the Basin, and an estimated 62 percent of the area’s economic activity. NAF El Centro, located in Imperial County, conducted a study of its economic impact on the region during fiscal year 2010. During this period, the base supported nearly 1,400 jobs and produced approximately $105 million in economic benefit to Imperial County. The report also summarized the base’s involvement in community programs. This fiscal year 2008 study analyzed the base’s economic and social ties to the surrounding Kings and Fresno County communities, where it supported 12,142 jobs and generated $717.5 million in labor income. Using data from the Ventura County Workforce Investment Board, the Navy conducted an analysis of the base’s fiscal year 2010 economic impact to the region, where it generated over 20,000 jobs and approximately $2.0 billion of economic benefits. The report also detailed the various ways in which the base is directly involved in the community. This short report developed for fiscal year 2010 analyzes the economic and community ties the facility shares with its surrounding communities in northern coastal Orange County. During this period, the installation generated 2,010 jobs and created $136.2 million in economic benefit to the region. This 2014 study, commissioned by the San Diego Military Advisory Committee (SDMAC) and conducted by Point Loma Nazarene University’s Fermanian Business & Economic Institute, analyzes the economic impact of SPAWAR to the San Diego region. The study finds that SPAWAR will provide $2.5 billion in economic impact in 2014, and directly employs 4,900 people in San Diego. Beale Air Force base conducted a numerical analysis of the base’s economic impact to the surrounding communities in Yuba and Sutter Counties during fiscal year 2011. The base directly employed 6,039 and generated an estimated $426.6 million in economic benefit to the region. According to an analysis conducted by Edwards Air Force Base for fiscal year 2012, the base has an annual economic impact on the local area of approximately $1.5 billion. In addition to the 10,647 people it directly employs, Edwards creates approximately 12,451 indirect jobs. The Air Force’s analysis shows that LA AFB’s Space and Missile Systems Center had a nearly $1.7 billion impact on the Los Angeles-area economy in 2013, directly employing 5,879 people and indirectly creating 11,776 jobs. Additionally, this 2004 analysis found that the El Segundo installation was responsible for 112,000 direct or indirect jobs in California, including 50,000 in L.A. County, and just over $16 billion in economic impact. These impacts, which include the impacts from its close partner The Aerospace Corporation, result from both base operations and the awarding of major defense contracts through the installation’s activities. Travis Air Force Base conducted an analysis for fiscal year 2013 of the facility’s impact to the surrounding area in Solano County, where the base employs more than 26,000 people and creates $1.66 billion in economic benefit.